Hello everyone! This is Cassandra from Creating with Color by Cassandra. Every once in awhile I like to see how many products I can use in a project...hee! And in this set today, I actually used 11 Jaded Blossom products!!! How fun is that?!?! All of the solid colors of cardstock are from Papertrey Ink. 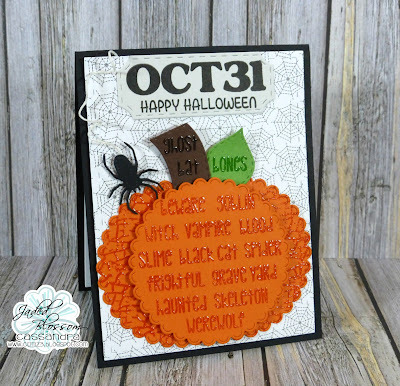 And the fun spider web patterned paper is from the Doodlebug Design ~ October 31st collection. I cut the background with the Jaded Blossom ~ Card Mat Dies. At the top, I used the Jaded Blossom ~ Ticket Book Dies for the label. The "Oct31" is from the Jaded Blossom ~ Halloween Bingo and the "Happy Halloween" is from the Jaded Blossom ~ Halloween Candy Wraps. The spooky little spider is from the Jaded Blossom ~ Halloween Dies. I made the pumpkin using the Jaded Blossom ~ Scallop Circle Dies. The stem is made with a tag in the Jaded Blossom ~ Mini Tag Dies 2. And the little leaf is cut with the Jaded Blossom ~ Layered Frame & Journal Dies. 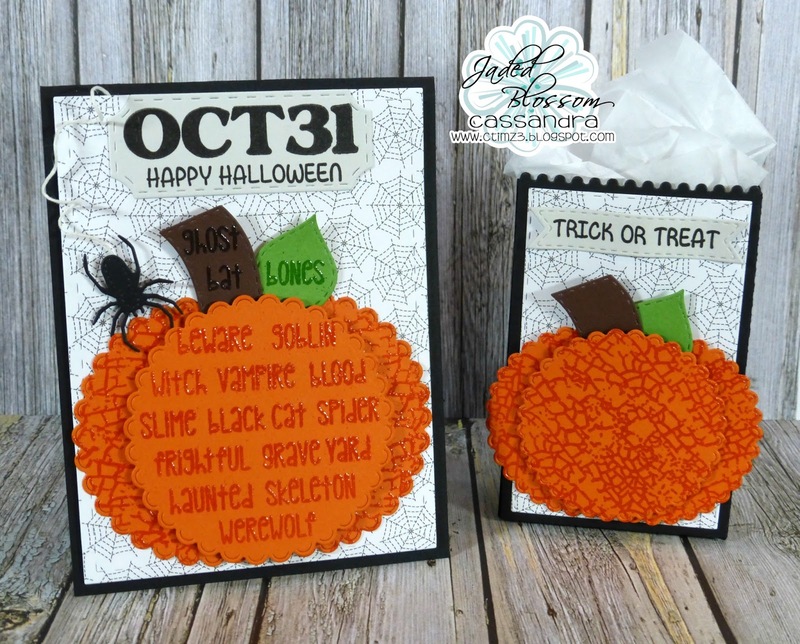 All of the fun words are from the Jaded Blossom ~ Halloween Signs. And I used the Jaded Blossom ~ Halloween Paint Splatters on the back layers of the pumpkin. I heat embossed it all with Versamark ~ Watermark Ink and Stampendous ~ Clear Embossing Powder. This is made with the Jaded Blossom ~ Goody Bag Die. I did the smaller pumpkin the same way as the larger pumpkin. And at the top, I used a tag from the Jaded Blossom ~ Mini Tag Dies 2. And the sentiment is from the Jaded Blossom ~ Halloween Candy Wraps. Well my creative friends, that's it for me today. 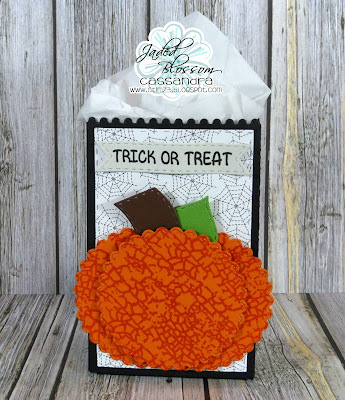 I hope you like this fun Halloween card and gift bag set. Have a great day everyone. I will see you all again soon. Wow, way to go on using 11 products!! That is a super fun set you put together! Wow!!! so cool!!!! Its amazing what you can do with all the JB goodies!! Fantastic use of all those stamps and dies. Love both of them, too cute! This is so darn adorable!! Awesome job! I LOVE all the JB products you used:) The embossing and fun papers are amazing! Super cute projects!